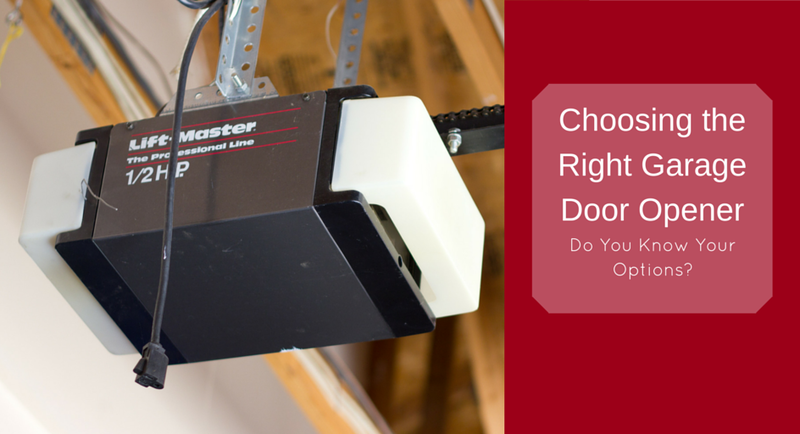 Choosing the Right Garage Door Opener ­– Do You Know Your Options? It is pretty much standard in this day and age for garages to feature automatic garage door openers. While at first glance they might all look the same, one look “under the hood” and it is easy to see that couldn’t be further from the truth. Choosing the right garage door opener requires either knowledge of each of the three main types of automatic garage door openers, or the advice of a trusted garage door expert. When it comes to garage door opening systems, the three main categories are belt drive, chain drive, and screw drive. In order to know which one would work best for you, you should know a little about each type to determine which one fits your specific needs. Belt drive garage door openers are by far the quietest of the three. They are generally sleeker in design and are commonly referred to as the “luxury” option. They are able to achieve an almost noiseless operation by using a belt, usually made from fiberglass, rubber, or polyurethane, to drive the door open or closed. Whereas a chain made of many links will vibrate and rattle, a solid belt will not, resulting in much quieter and smoother operation. They tend to fall right in the middle when it comes to price, positioning themselves just below screw drive openers and just above chain drive openers. Perhaps the most “classic” option available, chain drive openers are easy to install and simply use a chain to run the garage door along a track to either open or close position. As briefly mentioned earlier, chain drive openers are much noisier than belt drive openers, due to the presence of the metal chain moving along a track. The louder operation usually leads people to installing these openers in detached garages, where the noise won’t bother anyone inside the house. Some folks actually prefer the noise, as it serves as an alert that somebody is entering their home. Advancements in technology have contributed to quieting chain drive openers down, but you should still expect some noise. Mechanically very different from the other two options, screw drive openers rely on a threaded steel rod to rotate and move a trolley to open or close the door. There is no pushing or pulling of a chain or belt. The absence of a track means less moving parts, which in turn means fewer opportunities for pieces to break. Simply put, it’s a much more basic operation. Noise-wise, they fall right in between the virtually silent belt drive opener and the rowdier chain drive opener. They tend to cost more than the other two options but are less likely to break down and require less maintenance over time. No matter the type of garage door opener you are looking for, we at Superior Overhead Doors are here to help. Contact us to get started finding the right option for you.